Check out this stat: a sprained ankle happens over 25,000 times a day. That’s over 9 million sprained ankles every year. Obviously, a lot of people get them through sports and activities, and it is actually the #1 most common sports related injury. But, what’s also interesting is how common sprained ankles are for every day people who aren’t playing sports. In fact, it is worth understanding why sprained ankles have become so common, so you can take steps to lower your risk, whether you play sports or not. Okay, so why are sprained ankles so common? Well, think about this… a sprain occurs when the ligaments in the ankle joint get stretched too far or tear. If the ligaments get weaker over time, or if they become less stable, or if they lose their natural range of motion, it increases the risk of an injury. That makes sense, right? Pretty standard stuff, but most people never consider something as basic as their feet and ankles which is weird since those are the things that come into contact with the ground ALL the time. But, let’s break it down a little more. Your ankles are probably weak, unstable and inflexible. Almost everyone has ignored their feet and ankles and it’s not going to take much to cause a sprain. Why? Well, think about our history. We used to roam around the wilderness barefoot or with very minimal protective footwear. The ground had all kinds of terrain and forced our ankles and feet to be very strong, since stability and strength were always being challenged. Today? We wear uncomfortable, heavy shoes and walk on flat, even surfaces. And athletes wear stiff shoes with weak ankles and rely on speed and agility to twist and turn with a lot of force. Doesn’t that sound like a recipe for injury? So yeah… our ankles are weak and unstable because we don’t use them the way they were meant to be used. We don’t use our bodies very much either, but that’s just a fact of modern living. Okay, so you’re walking or running or playing sports and then you trip or land on someone else’s foot and your ankle twists and you fall. What happened? Well, the ligaments in your ankle got stretched too far or tore. They are like the glue that holds your bones together. Too much force was placed on them too quickly and they couldn’t handle it, so you sprained your ankle. Obviously, the more strength, stability and range of motion you have in your ankles, the lower your risk for an injury. And, even if you do stretch them too far, if they are strong and flexible, your injury will be far less severe. Your ankle will probably roll to the outside (an inversion sprain) and the ligaments on the outside of your ankle will get hurt. Your ankle will immediately swell up like a tennis ball (or softball if it’s worse), and you will have limited ability to walk on that foot. It will be painful and it will bruise pretty good in the next few days. It will stay stiff for a while and some scar tissue may develop and you may have some neuromuscular damage in the area. First thing you should do is visit a doctor and get an x-ray. Make sure you don’t have a fracture. Obviously, if you some kind of a break, that’s a game changer and you have to stay off of it and let it heal. But, if you don’t have a fracture, get into some rehab as soon as possible. 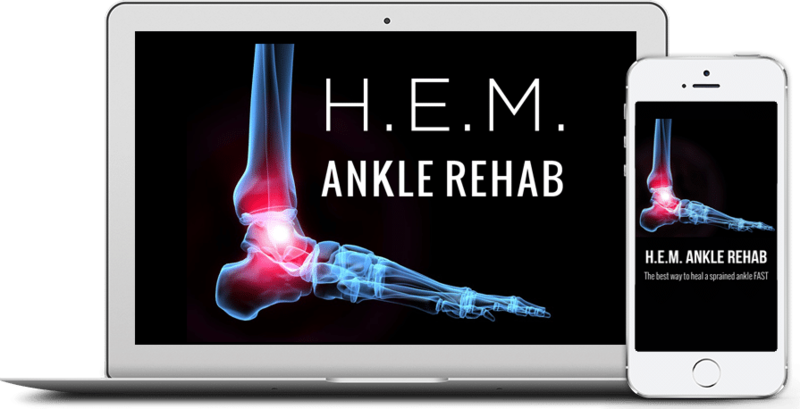 The sooner you begin rehabilitating your ankle, the faster and better you will heal. So, after a sprained ankle, depending on what you do, your ankle will stay stiff and weak and unstable for a long time or it will heal up fully. That’s the difference between doing nothing and doing rehab. So, don’t just sit there and elevate your foot and use a little ice and expect some good results. The body doesn’t heal well under those circumstances. And that’s why most people are in pain with weak ankles for months or even years… they never bothered to actually heal themselves. And then, once the ankle is healed up, remember to keep up some of the exercises and stretches so your ankle becomes more stable and flexible over time. Those are the keys for lowering the risk of another sprain. Don’t be like all those other people that just throw on a brace and make their ankles even weaker over time. Heal your ankle the right way and you will reap a lot of benefits from it, including increased speed and balance. It’s worth it! !